Bethany Academy Athletics, Home of the Eagles! We are dedicated to developing the student's athletic ability to perform at the highest level possible while teaching high Christian character and integrity. Our athletes learn teamwork, build skills, while developing positive leadership qualities, respect, and a strong work ethic. The ultimate goal is to honor God in all we do, both on and off the field of play, being humble in victory and gracious in defeat. The desire of all our coaches is to exemplify the life of our Lord, support our athletes in a positive and encouraging manner, and to inspire them to become all God wants them to be. Success or failure is not defined simply by the final score but by participating with a positive attitude, always giving a best effort, and using God-given talents for His glory. These are the life lessons our athletes learn through the Bethany Academy athletic experience. Bethany Academy is a member of the Minnesota State High School League. Therefore, we follow the rules and guidelines set forth by this organization for participation and eligibility. Bethany Academy Athletic policies should be followed except when a coach feels participation would result in harm or humiliation to a player. These policies may be suspended for league tournament games at the discretion of the coach. Bethany Academy is a member of the Minnesota State High School League and adheres to its policies and proceedures. The Minnesota State High School League is a voluntary, nonprofit association of public and private schools with a history of service to Minnesota's high school youth since 1916. Today, nearly 500 schools are members of the League. These member schools provide opportunities for athletics and fine arts competition for more than 200,000 high school students statewide each year. Varsity: Players dressing for varsity will play at the discretion of the coach. J.V. : All players dressed for J.V. should receive playing time in the game. Jr. High: All players should play at least once in each half. J.V. : All players dressed for J.V. should receive playing time in the match. Jr. High: Each player should play in at least one game each match. J.V. & C: All players dressed for J.V. or C should receive playing time in their respective game. Jr. High: All players dressed for Jr. High should receive playing time in the game. Elementary: All players dressed for Elementary should receive playing time in the game. Bethany Academy is in a cooperative agreement with New Life Academy (NLA). NLA is the host school, and participation guidelines are governed by NLA and the State High School League. Spirit Squad participants will be divided into varsity and J.V. squads depending on the number of students participating. They will be participating in basketball games with sideline cheers and a halftime performance. They will be participating in boys and girls basketball games and selected away games and/or tournaments, determined by the coaches. 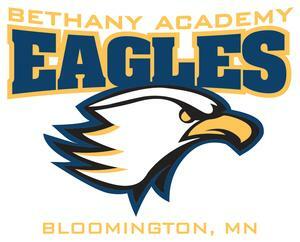 Bethany Academy Spirit Wear is a great way for you to show your Eagle Pride for one of the best High Schools in MN! A variety of clothing items are available in sizes for all ages. There is a limited supply of Spirit Wear clothing items available in the school office. Spirit Wear clothing may be purchased during normal office hours.